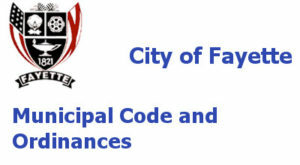 The Municipal Code for Fayette may be viewed in its entirety or by individual sections. These are the latest electronically available Codes and Ordinances. Other legislation may have been enacted but not yet codified.